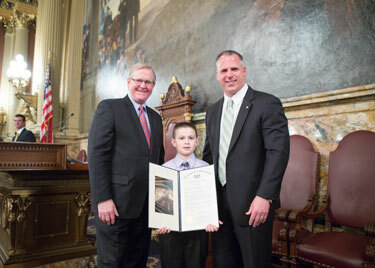 On Monday, April 7, state Rep. Joe Emrick (R-Northampton) presented a citation on the state House floor to 8-year-old Zachary Kraska, a student at Tracy Elementary School in the Easton Area School District. Zachary, a Pennsylvania State Indoor Federation of International Target Archery Champion in the Compound Male Yeoman Division for ages 9 and under, is also the outdoor champion for his age bracket, as well as the reigning State Games of America champion. Pictured with them is Speaker of the House Sam Smith.